*The images in this gallery are low resolution and sized for viewing on your computer. Please contact me should you want to purchase an image for print. Having been raised Catholic, we went to church every Sunday as a family, but Easter Sunday; Easter Sunday was very special. Every year we had something new to wear; a dress, hat, coat or shoes and sometimes, it was head-to-toe new. I remember the years that my mother made me a dress. For weeks, I would get to try it on and she would pin and tailor it to fit perfectly. The anticipation and excitement of seeing it finished was that of like Christmas. 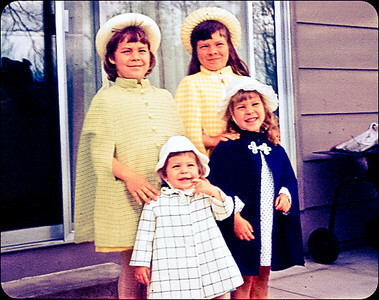 I believe all the dresses and coats in this photo were handmade by either my mother or grandmother. The night before Easter we would get our outfits together; Dress, hose, shoes, coat & hat, all hanging ready to go. We each had our own Easter basket that we set outside along with carrots and lettuce for the Easter Bunny. I’ll never forget the one year we went to open the back door to get our Easter baskets and there was a real live bunny sitting out there. There was a flurry to kitchen to get more carrots for him. Our Easter baskets were always amazing with a big chocolate bunny in the middle and various candy and little toys surrounding. How special we all felt heading off to church to celebrate Easter. Ditto irishmurr........and have a wonderfully blessed "Resurrection Weekend!" This brings back so many memories of Easters past for me too. Wasn't it so exciting to get those new outfits? I always loved that we'd get a hat -- and the stockings / hose, that we normally didn't wear. You all looked lovely. Your mother and grandmother were quite the seamstresses!